The Falling Leaves Shop Hop is almost here. If you have never been on this hop….you’ve been missing a really fun event. Seven shops. 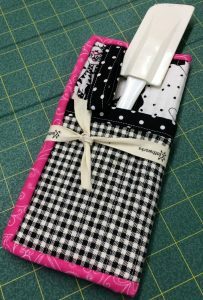 At each shop you will receive a “free” fat quarter and small project pattern each shop has created. When you complete the hop you will receive a “free” pattern to use these fat quarters. 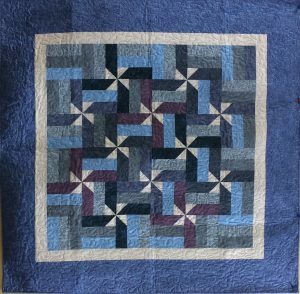 Each shop has finished their quilts differently and finishing kits can be purchased at individual shops that makes their shop sample. We also have 7 gift baskets (retail value $100) and 7 $100 gift certificates to distribute to 14 individuals who have their names drawn from the completed passports. And….each shop will be providing a demo on a new technique or template. It’s a great kick off for Fall sewing so call you friends now and start planning your road trip. Shop Hop runs September 29th – October 7th. All shops will be open 9:30 am – 5:00 pm Monday – Saturday and Sunday October 1st – 12 noon to 3pm. The Christmas Luncheon for Thimbles is set for December 5th. Fondue lunch at Pine Brook Farms. 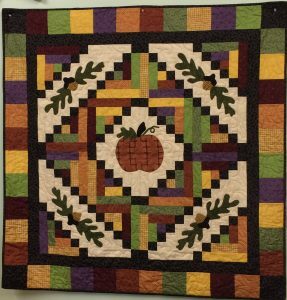 Sign up by attending one of the four scheduled classes (October 10, October 17, October 19, October 21) where you’ll be making a potholder for the Animal Shelter fund raiser which will be held November 30th at Spooner Market & Grill. Two great events back to back. Contact the shop for more details. Limit for the Christmas Lunch is 45 so don’t wait too long as this event fills fast. 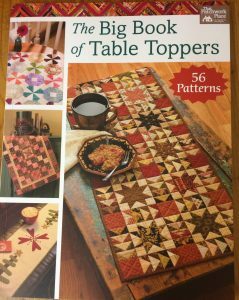 There’s still time to attend the first Pumpkin Table Topper Class we’ll be doing from the book. Class cost is free, but you must purchase the book. We also have kits. Enjoy your week. Summer ends Friday as we welcome Fall.